One of the benefits of being destination wedding photographers is we get to meet so many wonderful brides and grooms who also have a love of adventure and travel! When our couples are also open to doing a day-after portrait session somewhere different, we are always inspired! This couple got married at Villa Santa Cruz, a private hacienda in Todos Santos that is located just up the dirt road from our home. 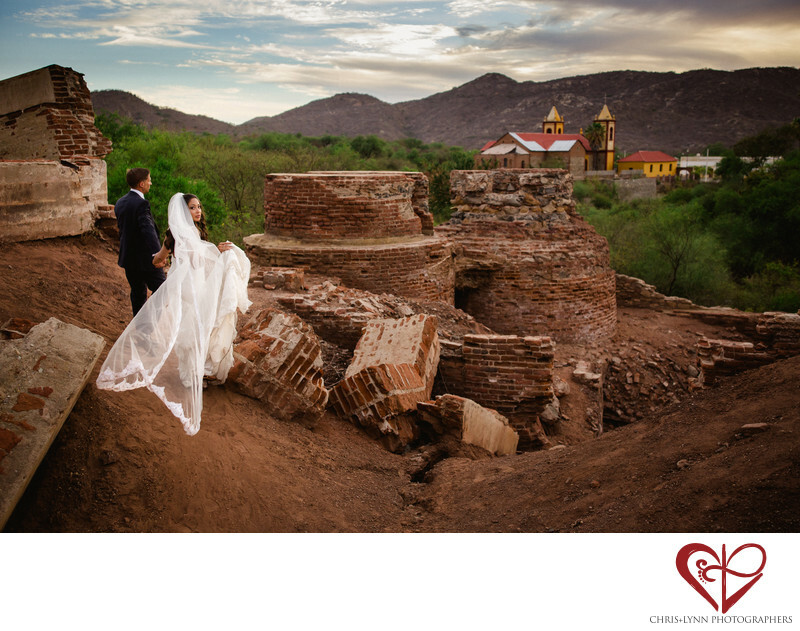 Our favorite venue in Todos Santos, Villa Santa Cruz is the perfect venue for an intimate wedding. The four-room villa is located on 8 hectares of completely secluded beachfront - when you walk along the ocean after your ceremony, you will be the only people on the beach! As a beauty and fashion editor, photography was very important to this bride. In addition to photojournalistic coverage of her wedding day, she also wanted to devote time to creating images that were completely unique. When she told us she wanted to do something totally different on her bride + groom day-after portrait session, we decided to head out to one of our favorite places in Baja - the abandoned mining town of El Triunfo - population 321 residents. Here, we wandered the colorful streets, popped into the piano museum, and climbed the hills to reach the 100-year-old ruins. I love that this bride was willing to hike through red dirt to create an image that truly expressed her love of adventure! The setting sun, the chapel in the distance, and the flow of her veil as she looks back at the camera make this image one of our favorite destination wedding photos in Mexico. If you are having a destination wedding in the Los Cabos, East Cape, Todos Santos or Pescadero area and are simply looking for accommodation for your guests, there are a ton of vacation rental choices available on Airbnb, Homeaway and VRBO. Our personal favorite vacation rental in Baja, Mexico is our own Todos Santos Beach House with Pool & Hot Tub. Location: Baja California Sur, Mexico. 1/1000; f/2.8; ISO 800; 35.0 mm.